The obituary of Eloise Reavis Peacock. Wilson Daily Times, 16 June 1951. In the 1920 census of Wilson, Wilson County: on Woodard Street, widow Etta Reavis, 45, tobacco factory worker; children Louise, 18, and James, 6; brother-in-law Fred Reavis, 26, carpenter; his wife Cornelia, 19, and son Ralph, 4. Louise and Cornelia worked as tobacco factory laborers. On 4 October 1923, Levi H. Peacock Jr., 22, of Wilson, son of Levi and Hannah Peacock, married Elouise Reavis, 20, of Wilson, daughter of Joseph and Etta Reavis, on 4 October 1922 in Wilson. W.A. Mitchner applied for the license, and Presbyterian minister A.H. George performed the ceremony in the presence of John D. Henry, Henrietta Foster and John H. Parris. Elouise R. Peacock died 15 June 1951 in Wilson. Per her death certificate, she was born 4 July 1906 in Wilson to Etta Fain; was a public school teacher; was married; and resided at 414 North Reid Street. Informant was Jeuetta Anderson. McCrorey Heights is an historic mid-century neighborhood in west Charlotte, North Carolina, that was once home to many of the Queen City’s leading African-American doctors, lawyers, educators and businesspeople. The McCrorey Heights Neighborhood Association is constructing a website featuring the histories of many of the homes in the neighborhood. One is 1927 Oaklawn Avenue, a bungalow belonging for fifty years to Abraham H. and Susan Peacock Prince. 1927 Oaklawn Avenue. Photo courtesy of McCrorey Heights Neighborhood Association. Obituary of Susan Hines Pyatt. Wilson Daily Times, 21 January 1944. On 12 February 1891, Alonza Davis, 27, of Edgecombe, son of Hector and Tabitha McKoy of Cumberland County, married Adline Pyatt, 16, daughter of Booker and Susan Pyatt of Edgecombe County. On 20 June 1894, Levi H. Peacock, 35, son of James and Mariah Peacock, married Hannah H. Piatt, 22, daughter of Booker and Susan Pyatt, in Wilson. J.H. Clark applied for the license, and Presbyterian minister L.J. Melton performed the service in the presence of Mattie Harris, Minnie L. McGowen and Eliza Winstead. In the 1900 census of Wilson, Wilson County: Levi Peacock, 30; wife Hannah, 28; children Olivia, 5, Hannah, 3, and Levi, 2; and mother-in-law Susan Pyett, 59, widow. In the 1910 census of Wilson, Wilson County: on Ash Street, post office clerk Levi Peacock, 40; wife Hannah, 38; children Oliva V., 15, Hannah, 13, Levi, 11, Susan, 6, Rubie, 4, and Vivian, 1; and mother-in-law Susan Pryett, 55, laundress. In the 1920 census of Wilson, Wilson County: post office clerk Livia H. Peacock, 60; wife Annie, 31; children Olvia, 23, Annie L., 21, Livia H. Jr.; Sudie 14, Rubie, 12, Vivian, 9, Bennie, 5, and John, 3; boarders Mary S. Roberson, 32, and Mary Brodie, 20; plus widow Susan Byatt, 62. 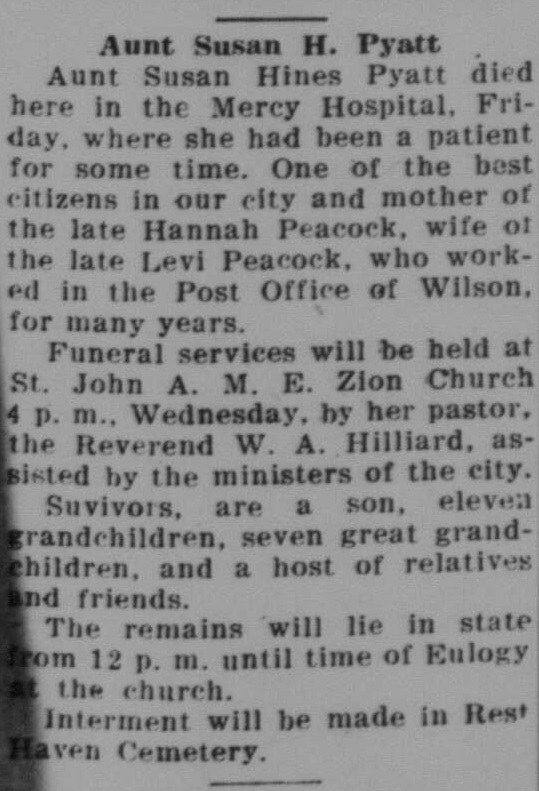 Hannah H. Peacock, 50, died 29 March 1935 in Wilson. Per her death certificate she was born in Edgecombe County to Booker Pyatt of Petersburg, Virginia, and Susan Hines of Edgecombe County; resided at 218 Ash Street; was a school tecaher; and was the widow of Levi Peacock. In the 1940 census of Wilson, Wilson County: Hana Peacock, 32; her grandmother Susie Pyatt, 84; and brothers John, 22, and Benjamin Peacock, 24. Susan H. Pyatt died 14 January 1944 in Wilson. Per her death certificate, she was born in 1874 in Edgecombe County to Louis Hargrove and Hannah Lewis Hines; was widowed; and resided at 218 Ashe. Studio shots, no. 39: Thomas Levi Peacock. Thomas Levi Peacock registered for the World War II draft in Wilson in 1946. Per his registration card, he was born 6 December 1928 in Wilson County; resided at 414 North Reid Street; his contact was Levi Harry Peacock; and he was a student at Darden High School. 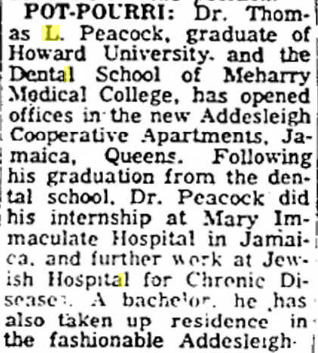 Thomas Levi Peacock graduated from Darden in 1947 and entered Howard University in Washington, D.C. He pledged Alpha Chapter of Omega Psi Phi fraternity in 1948 and graduated in 1951. Peacock enlisted in the Air Force after graduation and in 1952 graduated from Officer Candidate School. Wilson Daily Times, 12 July 1952. Baltimore Afro-American, 17 December 1963. … and was named one of the “Bachelors for 1964” in the August 1964 issue of Ebony magazine. Dr. Peacock is retired and, after returning to live in Wilson for several years, now resides in Florida. Photograph in the collection of Hattie Henderson Ricks, now in possession of Lisa Y. Henderson. She has passed from time to immortal. Raleigh Morning Post, 14 February 1902. In the 1870 census of the town of Wilson, Wilson County: farm laborer James Peacock, 51, wife Mariah, 47, and son Levi, 13, plus Herrietta Farm, 21, and son Levi, 3. On 8 June 1894, Levi H. Peacock, son of James and Mariah Peacock, married Hannah H. Piatt, 22, daughter of Booker and Susan Pyatt of Wilson. John H. Clark applied for the license, and L.J. Melton, Presbyterian minister, performed the ceremony in the presence of Mattie Harris, Minnie C. McGowan and Eliza Winstead. In the 1900 census of Wilson, Wilson County: Mariar Peacock, 70, engaged in washing, and “daughter” Marry, 11. A systemic coterie of dispensers of the ardent; or, his dive is a tough place. Wilson Daily Times, 12 December 1911. Coot Robbins — on 18 March 1912, Coot Robbins, 29, married Hennie Harris, 27, in Wilson. We are the Republican party and those who denounce us are the traitors. One hundred eighteen years ago today, four of Wilson’s African-American politicians — William H. Vick, W.S. Mitchell, Levi H. Peacock and Elijah L. Reid — submitted for newspaper publication a letter firmly denouncing the fusion politics of the era and declaring their firm allegiance to the Party of Lincoln. Wilson Advance, 25 October 1894. News of the colored graded school. Wilson Mirror, 22 July 1891. Wilson Daily Times, 28 May 1897. Frank O. Blount — in the 1880 census of Wilson township, Wilson County: gristmill worker Daniel Vick, 38, wife Fannie, 35, and children Samuel, 16, Nettie, 14, Earnest Linwood, 12, Henry, 10, and James O.F., 8, plus Frank O. Blount, 20, and Marcus W. Blount, 26. Though the Blounts were described as boarders, they were in fact Fannie Blount Vick’s brothers. Three years later, Frank and his cousin Samuel H. Vick (as well as neighbor Daniel Cato Suggs) were recorded in the junior class at Lincoln University in Chester, Pennsylvania. Frank Blount left Wilson before 1895. In that year, he is listed in the city directory of Washington, D.C., working as a porter and living at 463 Washington N.W. In 1900, he is found in the census of Saint Louis, Missouri, newly a widower, boarding at 2627 Papin Street and working as a janitor. Ten years later, he had gotten on with the post office and was living at 3030 Laclede with his second wife Mamie L. and her four sons, George P., 26, Cortello, 21, Robert M., 19, and Harrison Dove, 10. In the 1920 census, Frank and Mamie Blount are recorded at 3010 Laclede. Mamie Dove Blount died in 1930 in Chicago, but I have not yet found Frank’s death certificate. Catalogue for Lincoln University for 1882-83 (1883). Braswell Winstead — In the 1900 census of Wilson, Wilson County: assistant postmaster Braswell Winstead, 39, wife Ada, 25, and children Arnold, 13, George, 12, Rolland, 11, and Christine, 8. Levi Peacock — In the 1900 census of Wilson, Wilson County: postmaster Levi Peacock, 30, wife Hannah, 28, a schoolteacher, and children Olivia, 5, Hannah, 3, and Levi, 2, plus mother Susan Pyett, 50. Ada Battle and Charles Battle — Ada G. Battle and Charles Tecumseh Battle were children of Charles and Leah Hargrove Battle. Ada, born about 18, never married. Lucy Thompson — Per her death certificate, Lucy A. Thompson was born about 1875 in Wilson County to Ennis and Helen A. Ruffin Thompson. She was unmarried, a teacher, and died 24 July 1946. _____ Melton — probably Leavy J. Melton. Sallie Barber — Per her death certificate, Sallie Minnie Blake Barbour was born about 1871 in Wake County to Essex and Clara Hodge Blake. In the 1910 census of Wilson, Wilson township, Wilson County: mechanic Charlie Barber, 47; wife Sallie, 40, teacher; and sons Luther, 21, John, 17, James, 17, and Herbert, 15, plus two roomers. The colored graded school was renamed in her honor in the late 1930s. She died in 1942. The force of teachers in the colored school is very good. Wilson Mirror, 13 June 1894.